Interesting how even past 30 years old I still want mommy when I spike a fever and walk around with a box of tissues. Wondering why I never catch a 24 hour bug or never lose my appetite when sick. Sad to see my parents leave after such good times. Amusing to see the dogs go back and forth between both bedrooms looking for them. 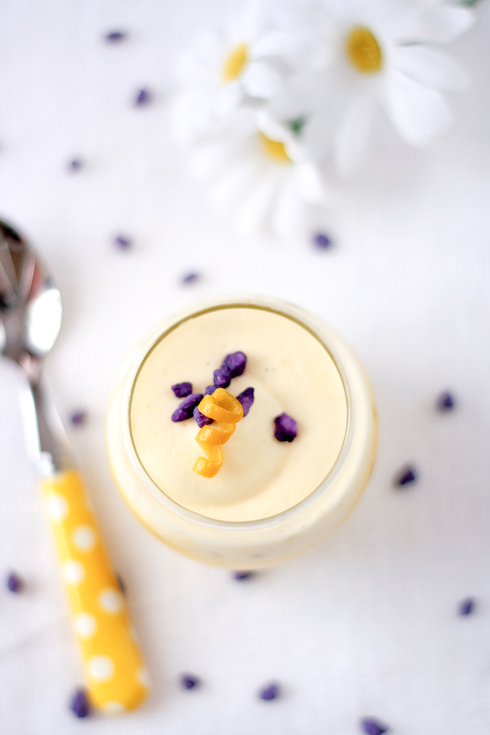 Funny how little mishaps can turn into creamy deliciousness like these Mango And Vanilla Bean Buttermilk Panna Cottas. The morning of my parents' departure, my father and I were up before anyone else as usual. We were reminiscing about the last few weeks spent together. We like to talk food while preparing meals. Surprise, surprise! When we were kids, my father taught us how to crack and juice a coconut, introduced us to the wonders of papaya simply sprinkled with lime juice, cooked the most fabulous Osso Bucco or rice pilaf. I guess he will be my other guest blogger when they come back! This past Sunday morning, the conversation fell on the wonderful meal my dear friend Bina prepared the last time we visited her and her family. After taking me to the Indian market so I could stock up on my usual and new favorites, she also sent me home with a whopping big can of Alfonso mango puree. We were happily surprised to find out that it was the same kind we would scout at the exotic market when I was a kid. We kept dipping our spoons in the can while getting breakfast ready. I poured some of the puree in 4 glasses for everybody to have a taste and proceeded to make breakfast. We decided to send them off with a hearty good old American breakfast and I decided to use the last bit of buttermilk I had to make pancakes. I went ahead and whisked buttermilk, vanilla bean seeds, sugar. I am not sure what exactly went array after that or when it did. Pressing needs of sleepy puppies, checking and re-checking and nothing had been left out of the suitcases, phone calls to and from relatives and friends,... I stood over the stove, poured some batter in the pan and turned around. Two minutes later, I heard "Aren't pancakes similar to crepes?" ...Hmmm...Yes they could be instead of the gunky burnt mess that was in the frying pan. I had forgotten the eggs and flour. "Oh dear...I am losing my mind! "...I looked at my parents and pulled out the croissants and toasts. Not much time left to fix anything, finally get in the shower and leave for the airport. I could feel my dad travelling nerves getting sharper by the minute but I hated to waste a vanilla bean anything. Panna Cottas quickly came to mind. I bloomed some gelatin in water, froze everybody's glass of pureed mango and heated up some cream and the vanilla infused buttermilk. Why freeze the fruit? I wanted clean layers for the fruit and panna cotta and once frozen you can easily pour your cream base without it falling straight to the bottom of the puree because of its heavier weight. It also quickens the setting process of the panna cottas but alas it was high time we left for the airport. So here we are now, parents sound and safe in France and us with two extra Panna Cottas. I served them with little Swiss meringue cookies (same as in Floating Island but piped and baked on a sheetpan) and chopped pistachios. They are so good I wish I could share with you! Note: I am aware of the pistachio recall here in the States and I am keeping up with the grower involved. Mine were from another farm but please check your stashes and sources. 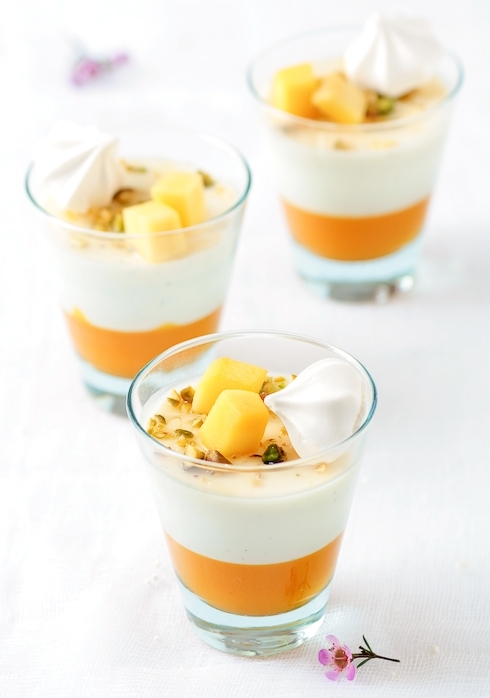 Divide the mango puree evenly among 4 glasses or ramekins. Place the water in a small ramekin and sprinkle the gelatin over it. Let it bloom while you prepare the cream. On a flat surface, cut the vanilla bean in half lengthwise without cutting all the way through. With a pairing knife, scrape the seeds from the pods. Set aside. In a medium saucepan, heat the heavy cream with the sugar and vanilla bean seeds until the cream is just about to boil, stirring occasionally to make sure the sugar dissolves completely. Remove from the heat and stir in the gelatin until it is completely melted. Let cool for about 10 minutes and add the buttermilk. Let cool to room temperature. You can speed up the process by placing your saucepan over a bowl filled with ice but keep and eye on it as it will thicken faster. Once the cream is cooled, slowly pour it over the frozen fruit and let set in the fridge, at least two hours, preferably overnight. Serve with chopped pistachios and meringue cookies if desired. Well, I guess there has to be a first for everything...This is my first time missing a Daring Bakers' challenge. Ever. In over 2 years. And does it feel weird!! But there are thousands of wonderfully executed challenges to be seen there. Just too much discombobulation here to do it justice. My mother was thrilled to see your enthusiasm regarding her ratatouille and the fear of "being out there" for others to see quickly dissipated with yet another bite of it! My parents are leaving on Sunday and we have been packing activities, visits, friends and family in as much as possible. All this between work, shopping and a few baking sessions of course. Mom and I did find time to bake Grandma's apple tart as well as these easy and delicious little tea cakes filled with raspberries and pistachios. One thing we never fail to do as a family is to take time for tea. When 5 o'clock rolls around, the kettle is on and the cookie tin finds its place on the table. Even miles away, this is a little "home away from home" tradition I still have. Helps me stay connected. I can picture my grandfather and my parents sitting together for tea and cookies or cake. Sometimes there are friends dropping by. Sometimes, it is a wordless conversation of comforting gestures. I tend to do the same. I close the notebooks and take a minute to breathe. Sometimes it is a bunch of kids and friends stopping by. Same as home. 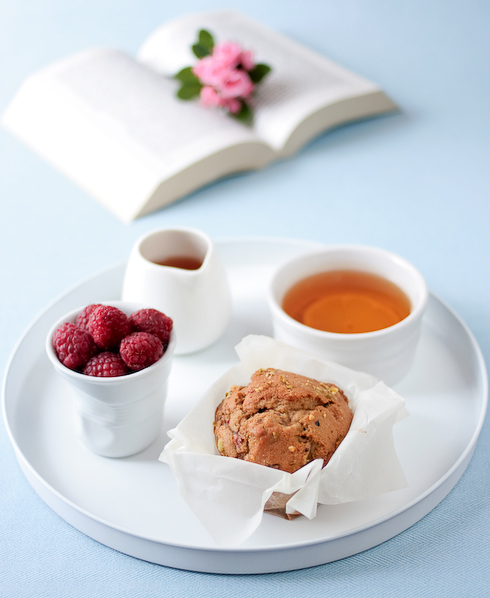 One thing for sure is that our tea time never goes without a sweet nibble. 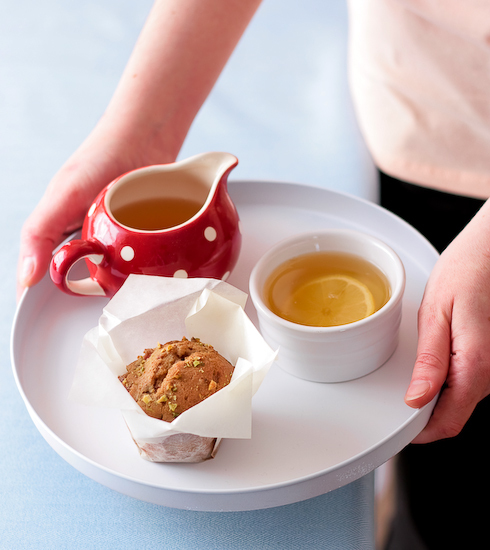 These teacakes are pretty straightfoward and lend themselves to all sorts of variations. We went through the pantry and the fridge and prepared mini cakes with fresh raspberries, but you could use strawberries or blueberries just as well. We went for pistachios but almonds, walnuts or hazelnuts would work beautifully here too. I like the flavor that the dark brown sugar imparts to these but feel free to use light brown or granulated sugar instead. I think I'll try to find time to bake them another batch to take on the plane ride back home and sneak some into their carry-ons! Preheat the oven to 350F. Lightly spray or butter 10 to 12 muffin cups or tins. Coarsely chop the pistachios and set aside. In a stand mixer fitted with the paddle attachment (or with hand held beaters), whisk together the sugar and the eggs on medium speed, until thick, about 2-3 minutes. Lower the speed and with the machine running, add the butter, vanilla extract, cake flour, salt and baking powder. Increase the speed to medium and whisk until just incorporated. By hand, fold in the raspberries, being careful not to break them up too much and half of the reserved pistachios. Divide evenly between the muffin tins (or other small molds). Sprinkle the remaining half a cup of pistachios evenly over the cakes. Bake for 20 minutes or until golden brown. Let cool on wire racks. I have to say that I am enjoying the extra bit of time given by my mom cooking some dinners while I can work on the usual, the new and/or the collaborated. Spring has me "springing" but as I proofread I am also in the "oh my God this is not good enough" phase....forgive my freaking out!!! Fortunately mom is here to bring my sanity back with a bowl of warm soup, a piece of cake or her delicious ratatouille. 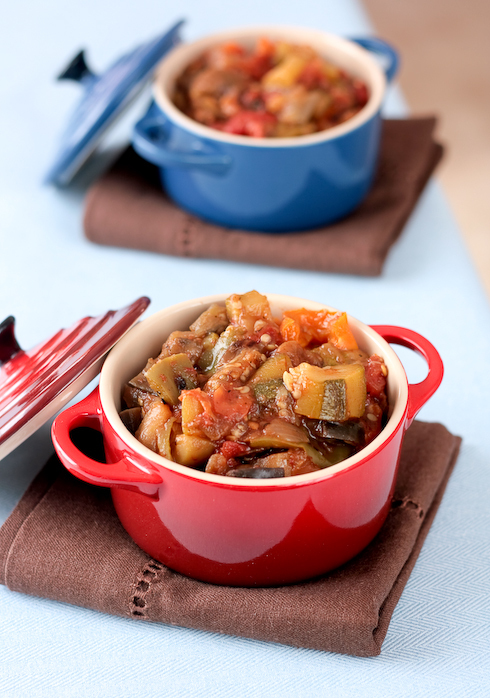 It's not often you see or will see again a savory recipe on this site but when I asked mom what she wanted to make for a guest post, she immediately replied "Je pourrais faire ma ratatouille!" (I could make my ratatouille!). "Pourquoi pas une tarte ou un gateau plutot?" (why not a tart or cake instead?). She admitted being more of savory cook than a baker and made me blush by saying that she already uses my recipes for baking so no need for a redo. But after a little nudging from you guys, we are also going to make a tart before they leave and we will do it completely together. Indeed, for the ratatouille, I pretty much shot the veggies in their raw and cooked form while she did everything else. I went to teach a class and when I came back the house was foggy with the wonderful smells of her ratatouille. A whiff of it is enough to let my mind wander home. There is no particular or nostalgic moment associated with it. She made it everyweek. I grew up on it like others do on collard greens or lasagna. It's us. It's simple. It's home. I keep telling her that hers is special. It's mom's. It's good. I wanted her to write about it with her own words but she left me the duty instead (I guess too busy playing cards with B. and my dad!). Mom will be the first one to tell you that every cook in Provence (where the dish is said to have originated) and in the world has a different recipe for it and a different method of cooking. She laughs out loud when she hears other cooks complain "did you see how he makes his ratatouille? Heresy!" She says the only heresy would be to cook something that you end up not eating. She was told by reference cookbooks back in the day that "the" ratatouille recipe was made with each vegetable cooked separately then all added together then braised. Mom does what most homecook does: cooks all the vegetable in layers in one pan. As I was writing quantities down for this post she came over my shoulder and said "the only rule I follow from those old stuffy book is to add the vegetables in the pan by alphabetical order. That's important". Ah well, yes mom, but that does not work from French to English! The spices also can be different from household to household. 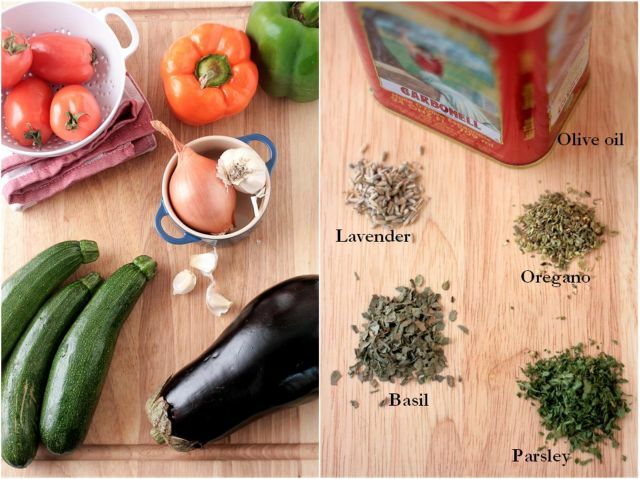 Ours traditionally include thyme, parsley, oregano, a pinch of lavender and basil and some "Quatre Epices". I ran out of the first and last one for the photo shoot but they did make it to the finished dish. Mom also added "tell you readers that I have no diploma in ratatouille making. This is simply the one that has been handed down from generation to generation in the family. I would not want to sound presumptuous about such a simple dish". How sweet can she be?!! I should warn you that we like ours on the soft and stewy side and it's not really the best thing for a beauty shot but I hope the pictures did mom's version justice. In a large saute pan set over medium (and I mean the largest you have that you can put a lid on), sautee the onion in a bit of olive oil until translucid. Add the diced eggplant and sautee until it becomes golden in color. Add a dash more olive oil and add the zucchini, then the peppers, tomaotoes and canned tomatoes. Add the whole unpeeled garlic cloves, the spices, salt and pepper. Do not stir. Cover with a lid and let stew for aout 15 minutes. At this point the vegetables will have reduced a bit in volume from cooking and you will have room to stir and mix the herbs with the rest of the ingredients in the pan. 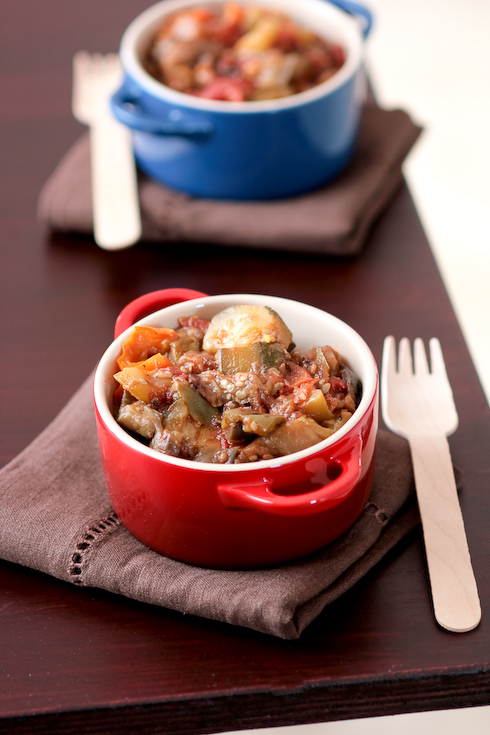 Turn the heat down to medium low and simmer for at least 30 to 40 minutes. Uncover and let simmer 20 to 30 minutes on low until most of the cooking liquid has evaporated. Today is the official first day of Spring. Yeah! Aren't you just loving this lighter feeling in the air? 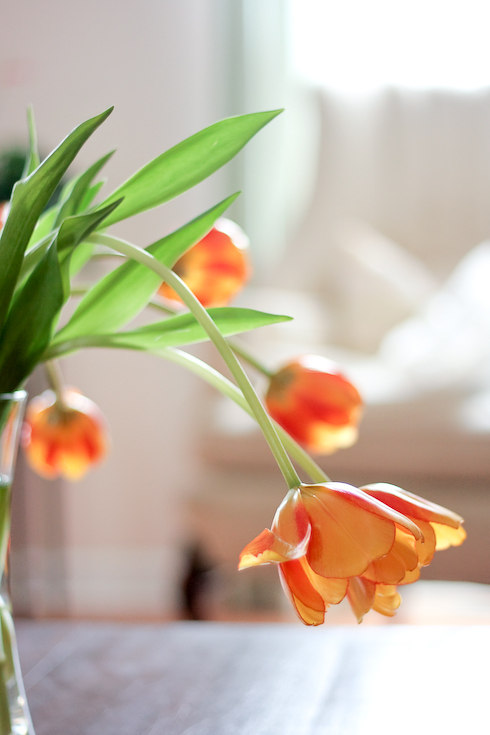 Blooms are everywhere to be seen and I keep bokmarking a ton on my Flickr favorites. I am addicted! People seem to slowly shred their winter attitude. Smiles and random acts of kindness are more frequent. I am trying to savor each day this Spring. It won't be long before we melt under the scorching heat and humidity as Summer seems to start way too soon around our parts. It is also Macaron Day in France. Yeah! Four years ago renowned pastry chef Pierre Herme collaborated with other pastry chefs in Paris to create Le Jour Du Macaron to raise money for charity. All you have to do is hop into one of the participating locations in France and other European countries to receive 4 free macarons and leave a donation in a charity designated box. I say that chosing the first day of Spring and its blooming promises was a brilliant idea. If you have access to free macarons and do a good deed at the same time, I say "Run to it!". And it is my brother's birthday. Yeah! Ok, I knew this last one would not move you as much as the other two but I have to tell him outloud "Joyeux Aniversaire Arnaud!". Last year I virtually gave him fun Swirly Macarons. This year, I went for a more subtle and Springy feel thinking about his adorable daughters and their love for all things pink or purple. 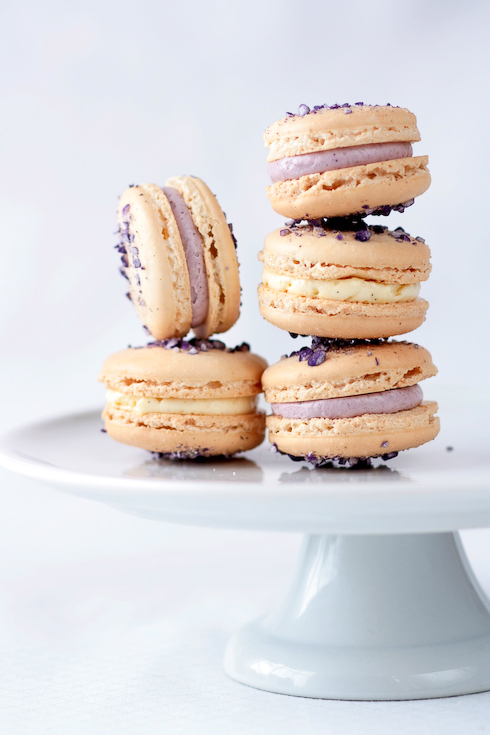 Because he lives in the violet city of Toulouse, I found it fitting to use the violet pearl sugar they sent me both outside and inside the macarons. I admit that anything strong with the scent of violet leaves me a little lightheaded or with that brain freeze feeling right between the eyes. However the crushed violet sugar was just enough to boost up the flavor of the shells which I had left plain, except for the natural almond flavor. For the violet buttercream, I melted some of the sugar in a tablespoon of water, let it cool and added it to half the buttercream (with a touch of violet coloring) and added vanilla bean seeds to the other half. For once, that was the extent of my kitchen experimenting madness! One reader kindly left a comment with this link if you are interested in getting candied violet petals. In a stand mixer fitted with the whisk attachment, whip the egg whites to a foam, gradually add the sugar until you obtain a glossy meringue. Do not overbeat your meringue or it will be too dry. Combine the almonds and powdered sugar in a food processor and give them a good pulse until the nuts are finely ground. Add them to the meringue, give it a quick fold to break some of the air and then fold the mass carefully until you obtain a batter that flows like lava or a thick ribbon. Give quick strokes at first to break the mass and slow down. The whole process should not take more than 50 strokes. Test a small amount on a plate: if the tops flattens on its own you are good to go. If there is a small beak, give the batter a couple of turns. Fill a pastry bag fitted with a plain tip (Ateco #807 or #809) with the batter and pipe small rounds (1.5 inches in diameter) onto parchment paper or silicone mats lined baking sheets. Sprinkle with the crushed sugar or violet petals. Preheat the oven to 280F. 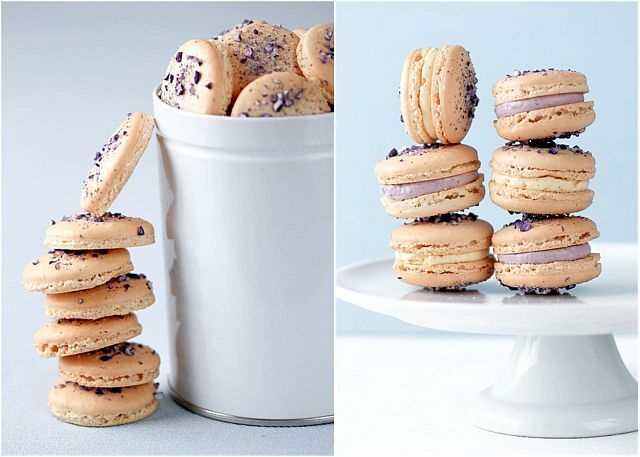 Let the macarons sit out for 30 minutes to an hour to harden their shells a bit and bake for 15 to 20 minutes, depending on their size. Let cool. If you have trouble removing the shells, pour a couple of drops of water under the parchment paper while the sheet is still a bit warm and the macarons will lift up more easily do to the moisture. Don't let them sit there in it too long or they will become soggy. Once baked and if you are not using them right away, store them in an airtight container out of the fridge for a couple of days or in the freezer. To fill: pipe or spoon about 1 big tablespoon of butterceam in the center of one shell and top with another one. Put the sugar and egg whites in a large heatproof bowl over a saucepan of simmering water and whisk constantly, keeping the mixture over the heat, until it feels hot to the touch, about 3 minutes. 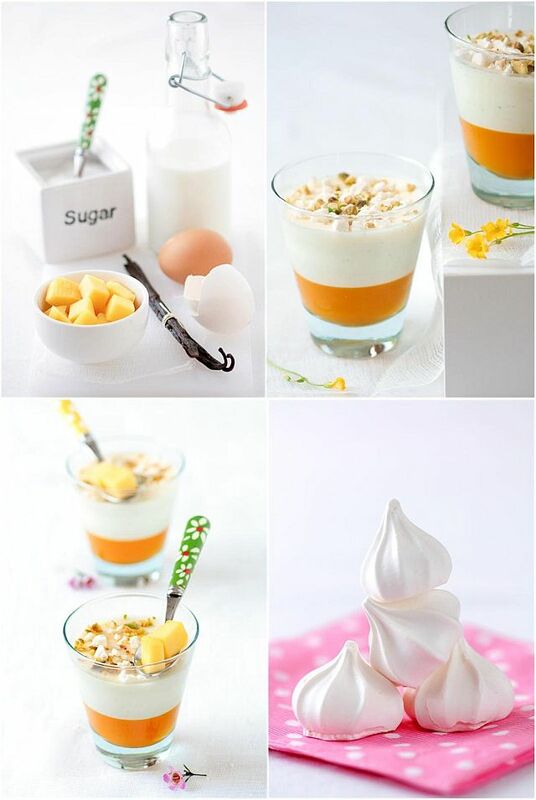 The sugar should be dissolved, and the mixture will look like marshmallow cream. Pour the mixture into the bowl of a stand mixer fitted with the whisk attachment and beat the meringue on medium speed until it cools and forms a thick shiny meringue, about 5 minutes. Switch to the paddle attachment and add the butter, one tablespoon at a time, beating until smooth. Once all the butter is in, beat in the buttercream on medium-high speed until it is thick and very smooth, 6-10 minutes. Divided the buttercream in two portions. For the violet buttercream: microwave the violet sugar and water for 30 to 45 seconds. Let cool completely before folding it into the buttercream. If using liqueur, just fold it in the buttercream. For the vanilla buttercream: add the seeds from the vanilla bean to the buttercream and fold with a spatula until fully incorporated. 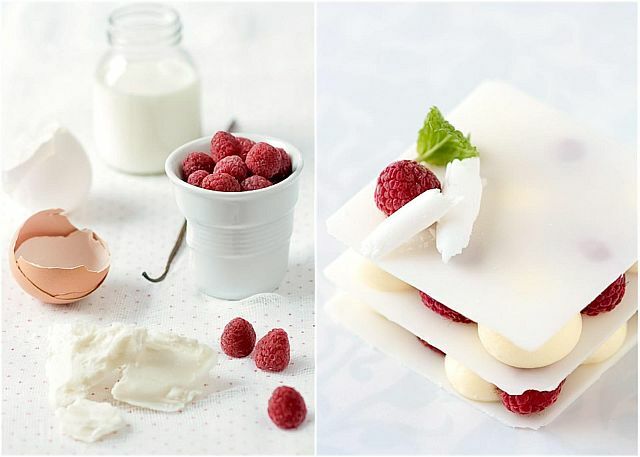 If not using right away, refrigerate for up to a week or freeze for up to 1 month. 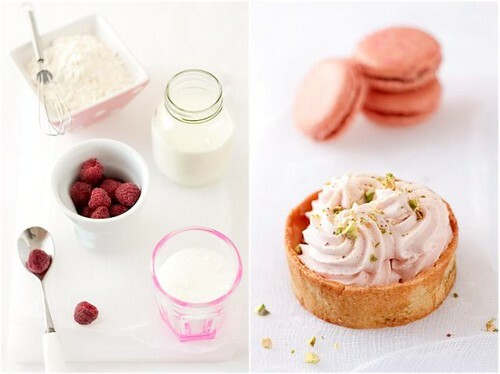 Even here it is bit "sans queue ni tete", posting the raspberry mousse tarts with pink macarons before posting about the macarons first. Indeed, a couple days after my parents arrived I made a small batch of pink macarons to go along with a verrine of Meyer lemon curd and chamomille - vanilla bean mousse. Then with the leftover macarons, I made the tarts. I think the mud cake cookie sandwiches were in their right place though. Imagine that!! See...discombobulated again. With one celiac at home right now, there have been a lot of cremes brulee, cremes caramel, macarons and mousses for desserts. Gluten does sneak everywhere but so far I have been able to keep everybody's sweet tooth happy and healthy. We love citrus. We love colors. We love Spring. I especially love yellow if it is in the form of lemon curd. I am not sure Meyer lemons will be around here much longer so I have been juicing, zesting and freezing away! Meyer lemons always have a slight cardamom note to me and the curd was very aromatic on its own, but took on a whole other dimension when layered with silky smooth mousse. The mousse itself starts with a pate a bombe which is lightly infused with chamomille leaves and vanilla bean seeds and lighten with some whipped cream. My lovely sister in law sent over a bottle of violet sugar pearls that I sprinkled on top of the verrines. It added a wonderful light flowery Spring note to the verrine and I am looking forward to using it again. In a saucepan set over medium heat, combine the lemon juice, zest and sugar and bring to a simmer. Stir occasionally to make sure the sugar is dissolved. In the meantime, whisk the eggs in a medium bowl just until combined. Once the lemon mixture is hot, slowly pour it over the eggs to temper, continuously whisking to prevent the eggs from scrambling. Return the mixture to the pan set over medium low heat and cook until thick. Do not let it come to a full boil or it might separate. Remove from the heat, stir in the butter and whisk until it is fully melted. Cover the surface with plastic wrap to prevent a skin from forming and let cool to room temperature. In the bowl of a stand mixer, whisk the egg yolks and the salt. In a small bowl, sprinkle the gelatin over 2 tablespoons of water, and let it sit while you make the syrup base of the mousse. Combine the sugar, chamomille leaves and the remaining 2 tablespoons of water in a heavy saucepan. Cover and bring to a rapid boil over medium high heat (prevents crystallization of the sugar on the side of the pan). Once the syrup comes to a boil, uncover and cook until the mixture reaches 238F. Strain the leaves over a container with a spout, it will be easier to add to the yolks. Pour the syrup slowly and into a steady stream into the egg yolks with the machine running on medium high. Melt the gelatin in the microwave for 10 seconds or until dissolved. Add it to the yolk mixture along with the seeds from the vanilla bean and continue to whisk on medium high until it triples in volume and cools to room temperature. In a separate bowl, whip the heavy cream to soft peaks. Add it to the mousse base and fold the two gently together. 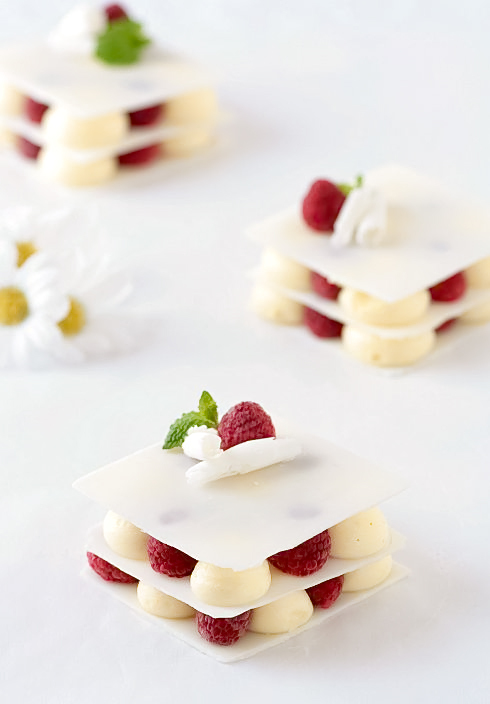 Pour the mousse in a pastry bag fitted with a plain tip (I use Ateco #807). 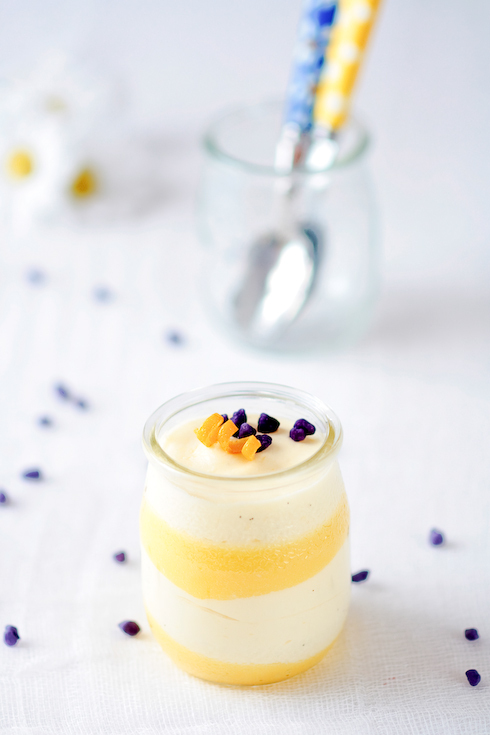 Layer the Meyer lemon curd and the mousse in jars or ramekins and refrigerate if not eaten right away. I almost forgot...My mom agreed to be a guest blogger here. Yeah! She is however hesitating on what to make. So, which recipe would you like her to make: her famous "ratatouille" or a tart? A few of you have left comments wondering how I find the time to bake, work, blog with my parents here for a month. Beside needing only a few hours of sleep, I have great friends willing to jump in here for a visit with you. I feel blessed to be able to count today's guest as one of my closest friends. We email each other anywhere between 5 to 15 times a day. She sends me pictures of her lovely boy and I of my crazy puppy (weird trade I know). I laugh out loud when one of us says "I made this today" and the other writes "get out! I just did that too!!" We can talk at length about our trade and not feel like complete pedantic geeks. She is been one of pillars of humor and stress relief (with Jen and Lisa) when I start freaking out about the book and everything around it. If we were neighbors, the key would be under the mat for her to come in anytime she wants. Scratch that...The door would be wide open, the coffee press and madeleines ready to go. I hope you enjoy her wonderful visit as much as I did! Hi everyone! I’m Aran from Cannelle Et Vanille and I’m here today with a little “show and tell”. 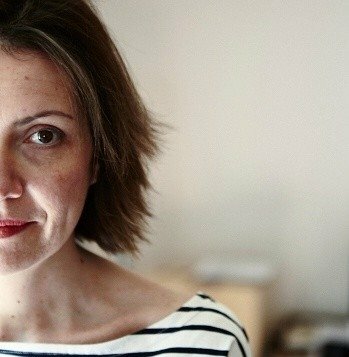 Helen is a busy bee at the moment working hard on her book that we are all anxiously waiting for. She asked me if I could be a guest blogger and gave me free reign. 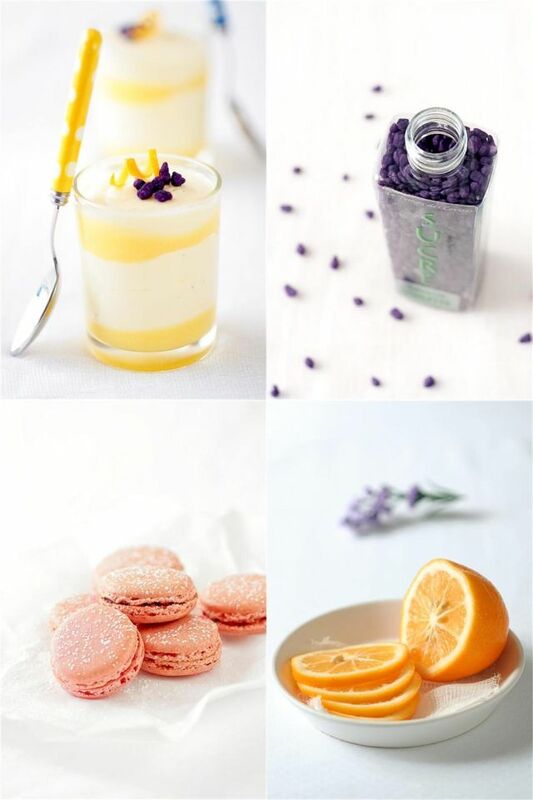 Of course, it would be silly of me to come here with a recipe (after all she is our “Zen Master Baker” as I like to call her) so I decided to share with you some of my latest obsessions. I am always amazed of the talent I find in Flickr. My jaw drops every time I see these photos so I had to, had to share them with you. Here we go. 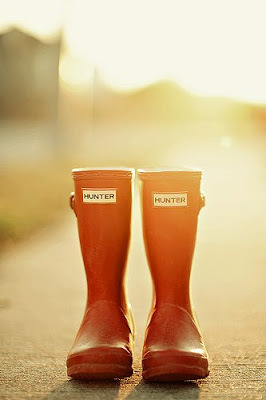 Rain boots- I am obsessed with Hunter boots and I love how Michelle aka Shelba captured her daughter’s Hunters in this shot. Dreamy! 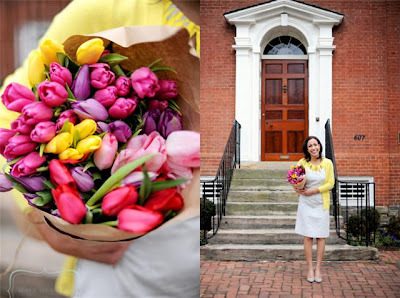 Flowers, color and yellow cardigans- Another photographer that I am obsessed with is Kate Headley. I love her use of color, how she captures the small details and how happy the people she photographs seem. This is lovely Maria. 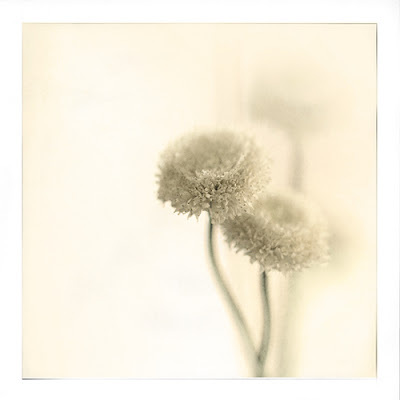 Ethereal flowers- Here I am again with flowers. Yes, I am obsessed with them. Even small, delicate weeds that I find in my backyard. Au Fil De has an amazing collection of prints on her Etsy shop and I think I bookmark every single photo I see. Natural light- I have become obsessed with finding the most perfect natural light for my photos so when I saw this shot by Eli19 I was in awe. Just magical. 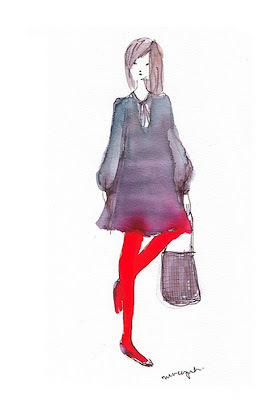 Feminine drawings- I am completely in love with all these fantastic watercolors by Miss Capricho. They are exactly how I want to dress, how I want to move… I would love for her to design a dress for me. Perfect skin and young talent- When I read in Olivia Bee’s profile that she was 14 years old, I couldn’t believe it. Such impressive work. 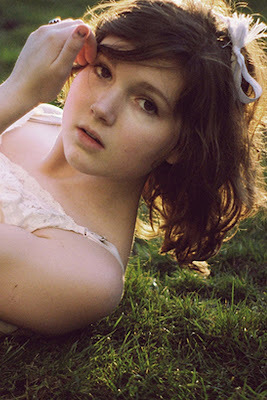 Her images are romantic, nostalgic, delicate, fun. They make me dream, just like this one. 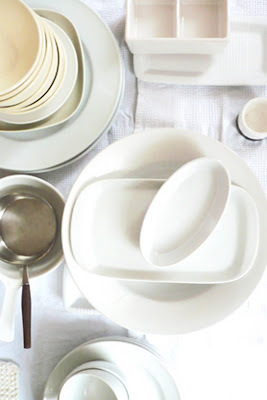 Dishes and props- I am in love with stylist Ljklee’s photos of her props. This collection of white ceramics makes me very, very jealous. 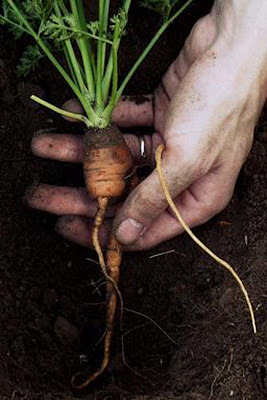 Vegetable gardens- I dream of having my own garden one day, but for now, I live vicariously through Nicole’s photos. There is something so peaceful and organic about them. 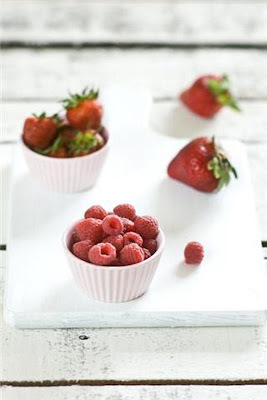 Summer berries- I love all fruit but summer berries make me especially happy. Peter from Souvlaki for the Soul is an amazing food stylist and photographer. His photostream in Flickr is breathtaking and I particularly love this photo. Simple and perfect lighting. 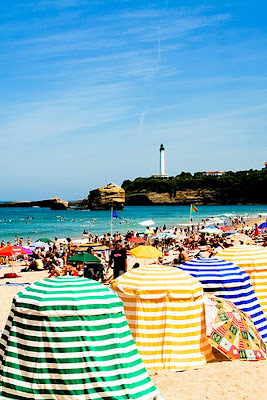 Basque Country in the summer- I remember going to Biarritz in the summer with my parents when I was a kid. The little cafes, all the flowers in the windowsills and all the chic women always made me dream a little more. I grew up only two hours away but crossing the border felt like such an adventure. Wicked Witch of the East is a Basque photographer who captures the everyday life like no one else. I want to be like her when I grow up. You can see more of my flickr favorites here. And thank you Helen for sharing this space with me! I can hardly believe my parents have been here a week already. Actually, I can notice it rather clearly: I only had time to make cookies this week! But these little bites of heaven were enough to keep us talking and eating for a few days! Imagine a chocolate cake with a hint of coffee sandwiched between two dark chocolate shortbread cookies and held together by a dab of chocolate ganache. The combination of textures is just perfect. A good bit of time is spent around the dinner table catching up, making plans. It's like being on vacation at home. The weather has been gorgeous and we have spent most afternoons out and about, sightseeing, catching the first flower blooms and enjoying the warm, already summer like temperatures. I hope I don't sound like a broken record with my "parent stories" but it is one of the most important things on my agenda right now. I want to write it down and share so I can remember and be reminded. It's a good break for them and a good break for me. I know B. loves having them around too as he and my mom are like two peas in a pod and he loves catching up with the family "back home". He's been so gracious in giving our "together time" for the next few weeks that I wanted to bake him something special. I know the man loves cookies. Small word if you saw his face when I asked what kind he would like. "Something fun!" he said. Small cookies are always fun and since it was for him and I know he likes cakes as much as cookies. 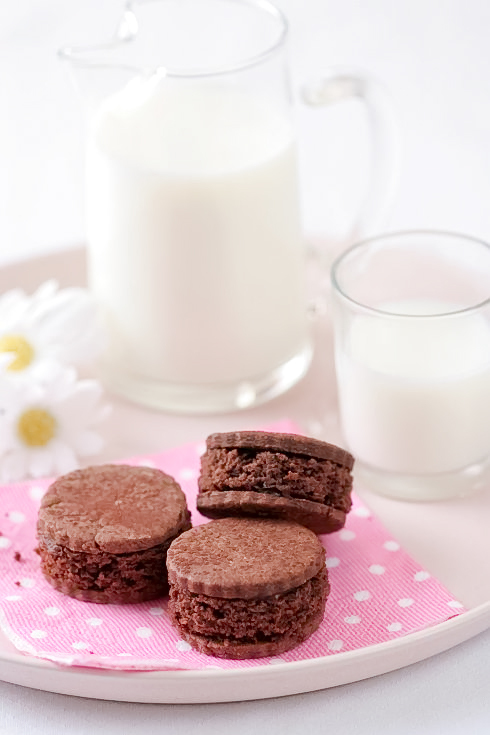 Mud cake cookie sandwiches fit the bill perfectly. It may sound odd, ok I admit it, it did sound really strange to my parents but trust me, it works. These are probably the best fun bites I have had in a while. Crunch, creamy and soft. 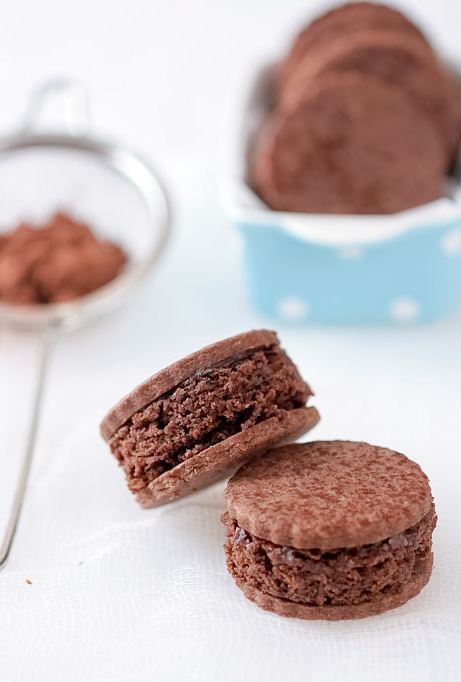 They are great with a simple glass of milk but they are also perfect with homemade chocolate sorbet. 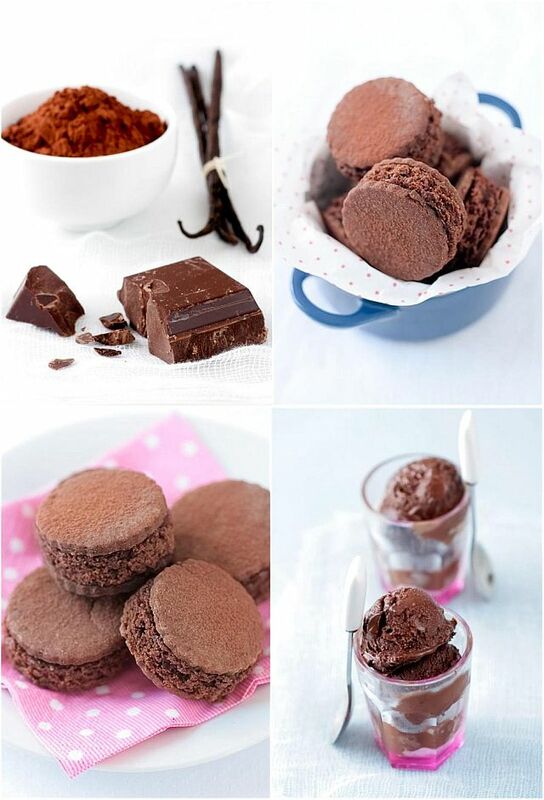 Pure chocolate therapy. In a stand mixer fitted with the paddle attachment, whip the butter and sugar until light and creamy. Add vanilla, then the egg yolks, one at a time, scraping the bottom and side of the bowl in between each addition. Add the flour, cocoa powder and salt and beat until the dough just starts to come together. Add some heavy cream if the dough still looks very crumbly and dry. Gather the dough into a ball, flatten it a little to a small disk and wrap it well in plastic wrap. Refrigerate two hours before using. Lightly flour your work area well and start rolling the dough from the center out, lifting it from the work area every 2-3 times you roll over it. With a 2 1/2-inch cookie cutter, cut out 48 rounds in the dough, gathering scraps and rerolling as you go (you might need to refrigerate the dough for 20 minutes if it becomes too soft to roll out easily). Place the cookies on 2 parchment lined baking sheets and refrigerate 20 minutes. Bake for 10-12 minutes. Let cool. Place the chocolate in a medium size bowl and set aside. In a small saucepan set over medium high heat, bring the cream to a boil. Remove from the heat and pour it over the chocolate. Let the mixture stand for 3 to 5 minutes. Slowly stir the chocolate and cream together until the ganache is completely smooth. Let cool to room temperature. Preheat oven to 350F. Slightly coat two 8-x12-inch pans with cooking spray and line them with a piece of parchment paper. Slightly coat the parchment paper with cooking spray or vegetable oil. In a small pot set over low heat, combine the butter, chocolate, sugar and water and stir until everything is melted and smooth. Remove from the heat, add the coffee liqueur and let cool to room temperature. Whisk in the egg yolks, then the flour and cocoa powder. Divide the batter between the prepared pans and bake for 20 minutes. Let cool completely. Cut 24 rounds of the same size as the cookies. I can't quite tell if it is my mother's warm hugs or Spring pointing its nose that has me thinking in all shades of pinks, purple and reds lately. Greens too. Colors are starting to pop everywhere and everyone around me seem to have that awakened sense of things changing around them. I have been sneaking some work time early morning and late nights but there is one particular thing I have been looking forward to when my parents said they'd come visit: sneaking into the bed with my mom after when dad gets up. Yep, I am slightly regressing and that is all fine by me! My dad gets up early and my mom likes to linger in bed just a half hour longer. 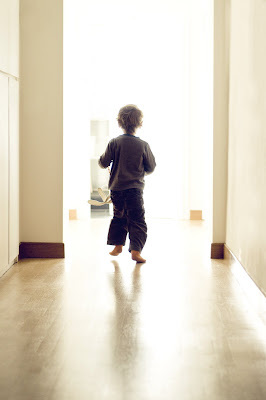 When I hear his footsteps down the stairs, I fetch him a cup of coffee, kiss him "bonjour Papa" and make a rush for the bedroom. I love the morning sun there. It kisses you just so, making you want to roll over and just enjoy. I often told my mom that I like to pick up a book and start my day with a few pages up there, in the silence of the sun and the skyes around me. The other day when she asked why, I did not know how to explain it at first. Suddenly I felt a rush of peace and warmth. "It's like when you hug me. It's that moment when we are on the bed and chat with sleepy eyes and fuzzy brains." 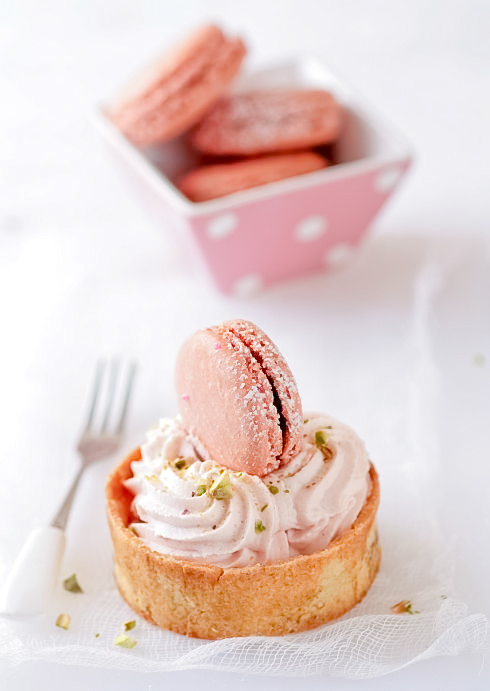 Later that afternoon, I was flipping through some of the pastry magazines she brought me from home and I stumbled on the cutest little sables tarts, filled with raspberry jam, pink mousse cream and adorned with pink macarons. A fuzzy morning sun embrace. I turned to her and I said "That's it! That's how it feels when we share! Like a pink creamy tart with a bit of a crunch!" She replied "Well, we should bake some then!" And we did... And we were quite happy to discover that they are also perfect during a passionate game of cards in the evening to calm every one's edge!! My apologies if I am not around as much in the coming weeks and especially if I am extremely slow in visiting your blogs. Soon I'll be able to get a breather and park my brain on "Spring break" mode before new adventures I hope! 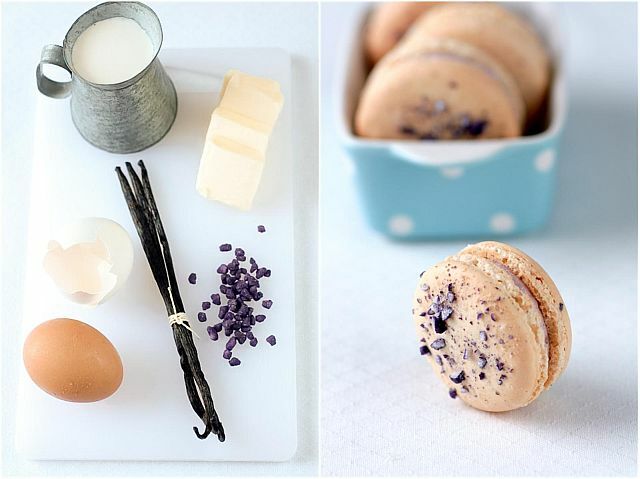 If you want to read more about the macaron recipe I used here, head over to Design*Sponge "In The Kitchen With" where Kristina asked me to provide a basic recipe to illustrate Matt Amerendiz's (Matt Bites) latest photo shoot. I dream of the day I would actually spend some time on a shoot with this super talented and genial photographer. Thank you Kristina! In a stand mixer fitted with the paddle attachment, whip the butter and sugar until light and creamy. Add the egg yolks, one at a time, scraping the bottom and side of the bowl in between each addition. Add the flour and salt and beat until the dough just starts to come together. If the dough seems too crumbly, add some cream, one tablespoon at a time. Gather the dough into a ball, flatten it a little to a small disk and wrap it well in plastic wrap. Refrigerate one hour before using. Preheat oven to 350F. Flour your work area well and start rolling the dough from the center out, lifting it from the work area every 2-3 times you roll over it. Do not be afraid to flour the work area well as you feel the dough getting warmer and softer. Cut out six 4 inch rounds and fit them inside six 3 inch tartlet molds pastry dough inside them, patting the dough in with your fingertips if needed. Place a small piece of parchment paper inside the tart shells, fill with beans or pie weights and blind bake for 12-15 minutes. Let cool to room temperature and remove the shells from the rings. Divide the raspberry jam evenly among the tart shells. In a ramekin, sprinkle the gelatin over the water and let stand until you prepare the cream. In a medium bowl, whisk the sugar, egg and egg yolk together, add the cornstarch mixing until you get a smooth paste. Set aside. Meanwhile in a saucepan combine the milk and vanilla bean on medium heat until boiling. Remove from heat and add slowly to egg mixture, whisking constantly to prevent curdling, (pour through a strainer if this happens). Remove vanilla bean. Place the egg mixture back into a medium saucepan and cook over medium heat until thick, stirring constantly. Add the jam, cook another 30 seconds and remove from the heat. Immediately add in the gelatin and stir until completely dissolved. Place a piece of plastic wrap on the surface of the cream so that it does not develop a skin as it cools to room temperature. Whip the heavy cream until stiff peaks form and gently fold it into the pastry cream. Pipe or spoon the mousse immediately in the cake rings. 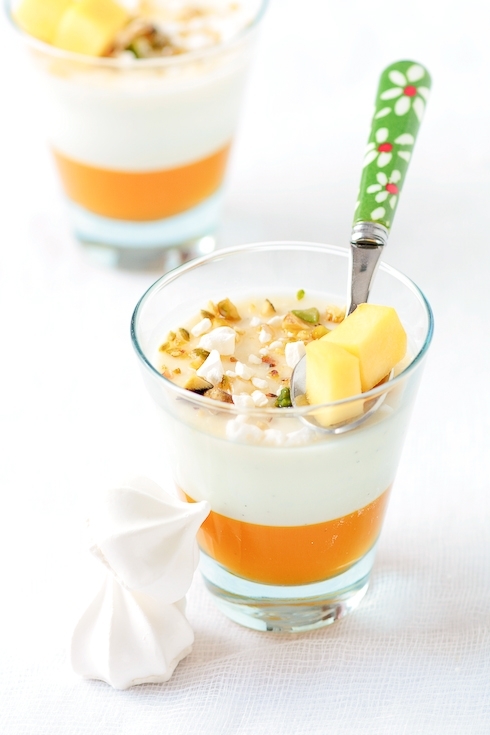 If you have any leftover, spoon into dessert dishes or glasses for quick snack. 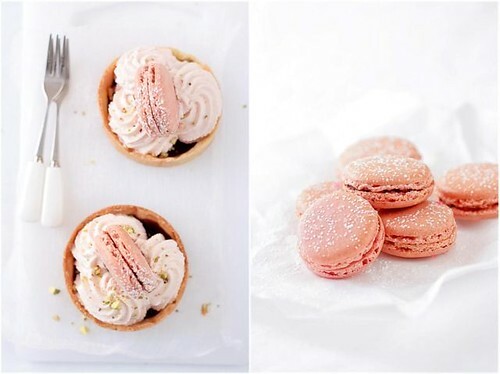 Decorate with a macaron and some chopped pistachios. Hugging my mom, joking with my dad. This is pretty much all I have done in the past 24 hours. It had been a year since I last put my arms around maman and two(!) since I was able to share some fun tidbits with papa. It had never been that long but such has been life on both sides of the ocean, with timing, responsibilities, projects and happenings that we have been this long apart since I moved here. After a long delayed connecting flight and one suitcase missing, I was finally able to kiss them profusedly and start planning some fun things to do in between work and more work while they are here. When they visit, I still cook as I would for B. and myself and try to give my mom a real vacation. They do so much for the rest of the family when they are in France that I enjoy pampering them. My dad can read, walk to the dock and clear his mind of all his responsibilities back home. My mom just sits at the kitchen table and we talk and gossip while I bake or cook. She is my favorite prep cook (she does a mean chopping job) and loves to pick on all the little things that have changed around the house. Place the chocolate in a bowl over a saucepan of simmering water. Make sure that the bottom of your bowl fits snuggly over the pan and that it is never in direst contact with the water. Stir the chocolate constantly as it melts. Continue stirring the chocolate until is completely melted and registers 110F on a candy thermometer. Remove the bowl from the water bath let it cool to 82F. Set the chocolate over the warm water again and stir it until is reaches 88F. Spread the chocolate on a very clean and even surface in a very thin layer ( I use the back of a sheet pan that I only use for chocolate and caramel applications). Let it cool and harden completely before cutting 3 inch squares in the chocolate layer. Gently lift the squares and set them aside. Combine the sugar, cardamom pods and the remaining 2 tablespoons of water in a heavy saucepan. Cover and bring to a rapid boil over medium high heat (prevents crystallization of the sugar on the side of the pan). Once boiling, uncover and cook until the mixture reaches 238F. Strain the pods and seeds in a container with a spout, it will be easier to add to the yolks. Pour the syrup slowly and into a steady stream into the egg yolks with the machine running on medium high. Melt the gelatin in the microwave for 10 seconds or until dissolved. Add it to the yolk mixture along with the seeds from the vanill bean and continue to whisk on medium high until it triples in volume and cools to room temperature. 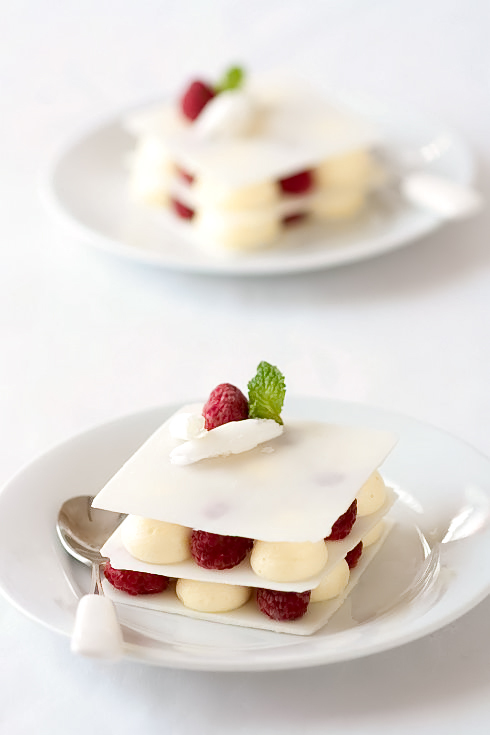 Place one chocolate square on a plate and alternate pipings of mousse and raspberries, top with a second chocolate squares and repeat. Top with a last square of chocolate and a raspberry and chocolate shavings if desired.